Facebook is one of the best and rather world’s top social networking site where we can share our thoughts and experiences with our friends and family members. Facebook also connect with the people which are lives in far away from us. As we know that the color of the Facebook is blue and sometimes we feel boring to see every time the blue color, Facebook does not provide any method by which their users can customize their Facebook profile and change their theme from boring blue to other color. Facebook is not open source as compare to Myspace where users can change some features according to their likes. Facebook hasvast number of features that’s why there are number of best Facebook tricks and hacks. But don’t worry with help of some Mozilla Add-ons and with some chrome extensions you will become able to change Facebook theme color and you can change any color according to your liking. There are many plugins by with the help of you can change some features like appearance, color and background images. Therefore, here we have the perfect method of enjoying themes on Facebook. How To Change Facebook Theme Color. 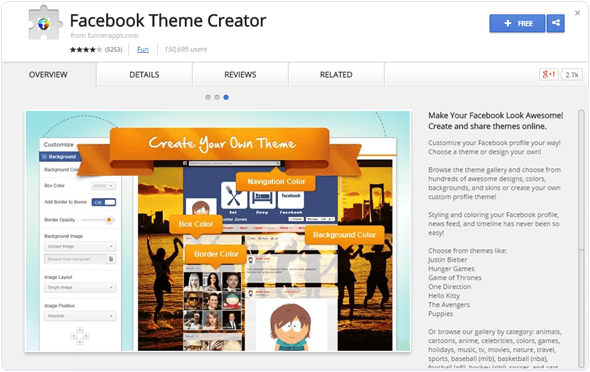 Facebook Theme Creator – Chrome Extension. Facebook Theme Creator is a chrome extension, with the help of this extension you can change Facebook theme. Because there are many different Facebook themes in this extension and you can apply any theme according o you. Note: Whenever you will do the customization with these extensions or add-ons it will only appear to you, not other users. 1. First of all open chrome browser and download Facebook Theme Creator extension for chrome from chrome web store. 2. Click on +FREE on the right side. It will add extension automatically on your browser. 3.To use this extension it will tell you sign in chrome after this you can change background, bar color and appearance according to you. 4. Therefore, To use this extension it will install app on your Facebook apps, click on themes creator app then apply any design you want. In this way, you can also enjoy a good themed Facebook layout on your computer. Show your friends and amaze them with this simple yet attractive Facebook trick. Hence, We hope that you like this article about how to apply themes on Facebook. If you find this article helpful, share it with your friends. Feel free to leave your valuable thoughts and suggestions in the comments below.